So I’ve heard people say. About the 15th of October, , two children of a family named [Peterson]… had gone one evening to bring in the cows. The elder of the two was a girl of  and the other a boy of . As they did not return when expected their parents instituted search but not finding them, they alarmed the neighbors and a systematic search began that was kept up for nearly two weeks but it availed nothing as they could not find a trace of them. At one time during the search there were over 100 men engaged in it. Finally the search was given up and it was a great mystery what had become of them. They had disappeared as completely as if some gigantic bird of prey had swooped down and carried them away. Dally goes on to tell about what happened about the middle of December of that year. A couple of days after a snowfall, an Indian who was out hunting saw some tracks in the “pathless wilderness.” Curious, he followed them and found the body of the girl, dead probably less than a day. The Indian went to a neighbor of Helsper’s, a Mr. Bloxham, and despite some difficulty because he did not speak English, was able to communicate to him that he had found the girl. Bloxham and two relatives went out to retrieve the emaciated body of the girl, and while there, discovered the body of the boy, which was frozen into the ground. It appeared that he had died a month or more earlier. The children were returned to the farm they had left that fateful fall day and buried next to their parents’ house. No lasting marker was put up. Even the lilac bushes that were planted at some time next to the graves are gone. The house is also gone except for part of the foundation. Nevertheless, the grave site is still safeguarded by the owners of the property, John and Ruth Heisick, who have expressed interest in properly marking the graves. The last name of the family was known by Heisicks to be “Peterson” and this fact was verified by examining their Abstract of Title to the land. Andreas (known as Andrew) Peterson homesteaded the land and received a patent from the United States in 1879. The names of the children appeared to be lost to the past as local residents familiar with the tale did not know them, nor were the whereabouts of relatives of the family known. The information was not lost, though. Census records did not yield results but a simple look at the archives of the County Recorder’s office gave the results this author was seeking. The index to the deaths in the county listed two names that appeared to be good possibilities: Maria and Christian Peterson; Date of Death: Oct. 31, 1870. Record Book A gave more information: Maria’s age, 10; Christian’s age, 8; Place of Birth: Denmark. On the second page the parents were listed as Andrew and Theodasia Peterson. The link to the lost children came in the category “Cause of Death” which was listed as “Lost in the woods.” The children, Maria and Christian, had been found again. This article was written by Mr. Hovland in 1997, when he served as a board member of the Morrison County Historical Society. It was printed that year in the Historical Society’s newsletter and is reprinted here with permission from the author. The Morrison County Historical Society recently received a letter from Dan Hovland, President of the Upsala Area Historical Society, concerning the placement of a monument for The Lost Children of Two Rivers. A few years ago, MCHS collected donations for the monument from Erv & Hope Klein, Bob & Gayle Gilmore, Dan & Marlene Hovland, and Art & Jan Warner. These funds have been sitting in an account until such time as needed for a marker. That time has come. Dan wrote an article about The Lost Children of Two Rivers for our newsletter in 1997. 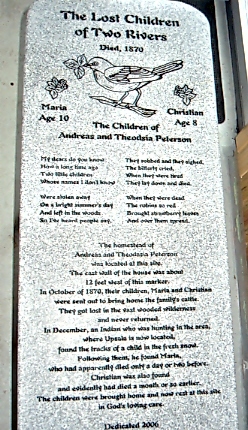 The children, Maria and Christian Peterson, perished in the fall of 1870 after being sent to bring in the cows. After they were found in December of that year, their bodies were buried near their parents’ house, on land now owned by John and Ruth Heisick between Elmdale and Upsala. The Heisicks have taken a personal interest in protecting the grave site and had long hoped to have it marked. The granite monument was designed by the Heisicks and executed by Peg and Brad Bellamy. The Bellamys hand-cut the stencil for the memorial and Brad sandblasted the design. The monument was officialy dedicated on June 1, 2006. In his letter, Dan thanked the Historical Society for its help in soliciting funds for the memorial. We are pleased that another piece of Morrison County’s history has taken physical form through the hard work and dedication of all who cared about and contributed to the memories of Maria and Christian Peterson. Memorial to the Lost Children of Two Rivers, photo by Dan Hovland, 2006. From the Morrison County Historical Society collections. That would be great, Dianne! Thanks for checking. How do I ‘share’? there is no ‘share’ to click on. Hi, Dianne – We didn’t have our share buttons activated. I think WordPress added those when we weren’t looking (likely a long time ago!). 🙂 Thanks for letting us know. I’m going to add them to the other sections of our website. Share away! My great great grandmother was ingeborg Peterson of Swanville. Apparently she took custody of the property of Andrew Peterson in 1904 in an attempt to sell it. I stumbled across this blog after finding her grave, and lo and behold there is another unknown peterson grave beside her and her husband in the cemetery in Swanville. Any ideas who it might have been? It’s like my relatives just didn’t believe in headstones or names or anything. Hahaha. Hi, Jewel – What cemetery in Swanville was the unknown Peterson buried in? I have a great Swanville contact that might be able to track down a name, but there are several cemeteries in that area so it’d be helpful to narrow it down.